Finally the nighttime temperatures dropped below 80 degrees. Unfortunately the daytime temperatures were above average toward the end of the month and too hot for transplants. The zucchini planted from seed at the end of August started producing. The okra and eggplant continue to steadily produce. Most of the bell and chili pepper plants rejuvenated and began flowering. The Armenian cucumber, planted in July, has produced 1 large cucumber and many more small ones have been spotted. The melons planted in August are doing well and began flowering. The tomatillo has many flowers and I am hoping to finally produce some fruit. The Corsican gourd plant has revived and is flowering again, so I am hopeful that I will get some this fall. I am growing this as I really want to see if I can make an artful bowl. Several tomato plant volunteers, from our homemade compost, have been successfully transplanted and are doing well. One of the tomato plants that survived through the summer has its first baby tomato. Planting guide updates include - Composting sheet added to the planting guide. 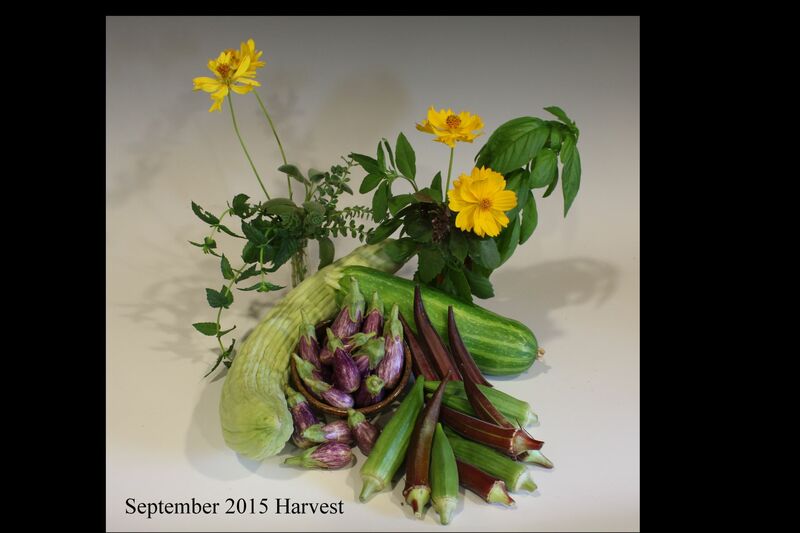 The okra and eggplant continued to produce. The new Armenian cucumber plants are doing well and producing. 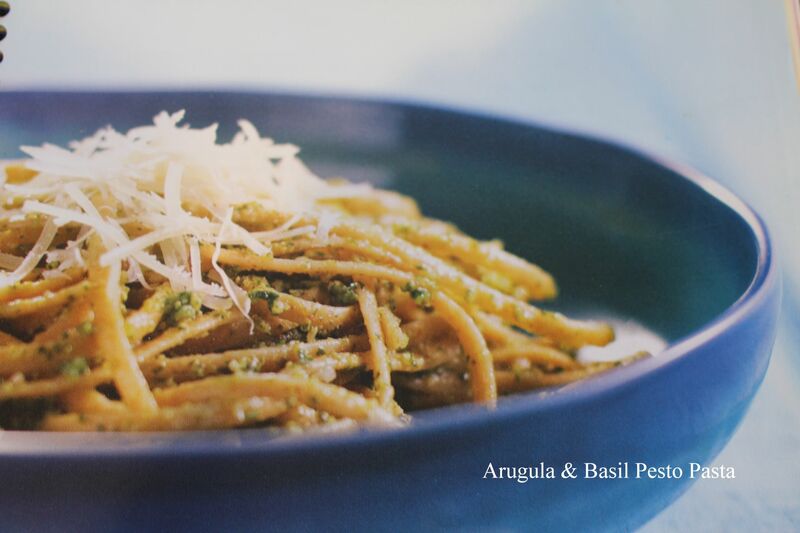 The basil has really taken off with the lower evening temperatures and is the inspiration for this months recipe. The zucchini plants are doing great and the first zucchini has been harvested. The new seeds planted are sprouting (carrots, green onions, cabbage, lettuce, kale, cauliflower, snow peas, borage, parsley, marigolds, basil). Several tomato horn worms had to be removed. I will try planting tarragon with the tomato and pepper plants in the spring as it is reported to deter horn worm. The warmer than average temperatures in September has delayed the recovery of several herbs in the garden (sage, oregano, lavender) and delayed planting in some of the garden areas with long sun exposure. Provide shade to new transplants. Keep seeds moist for proper germination. Make sure water penetrates 6" into soil each time you water. Keep soil/roots cool with 2 - 4 inches of mulch. Make sure you revitalize your potted plants by removing and replacing the soil or at least removing the top 1 - 3 inches and replace with rich compost. Every couple years the pots should be emptied and cleaned to remove soil pathogens. Try companion planting to help ward off pests and diseases. See the planting guide to identify companion plants. October is the month to plant garlic when soil temperature are 80 - 90 degrees and it is a great companion for beets, tomato and lettuce, but also good around stone fruit trees and roses. Hold off trimming any frost sensitive shrubs. 1. Mulch all bare soil areas and top off exposed areas that may have exposed soil. 2. Foliar fertilize with worm tea or seaweed/fish emulsion solution every 2 weeks. 3. Prune trees of dead and damaged wood. 1. Don't transplant broccoli, brussel sprouts, cabbage and cauliflower until temperatures are consistently below 100°F. 2. Don't fertilize established trees and shrubs. Wait until February. • Vegetables: Beets, Bok choy, Broccoli, Brussel sprouts, Cabbage, Carrots, Cauliflower, Celery, Chard, Collard greens, Endive, Garlic, Kale, Kohlrabi, Lettuce, Leeks, Mustard, Onions, Parsnips, Peas, Radishes, Rutabagas, Spinach, Turnips. • Herbs: Anise, Basil, Borage, Cilantro, Chives, Dill, Fennel, Lavender, Lemon Grass, Marjoram, Mint, Oregano, Parsley, Rosemary, Sage, Savory, Thyme. Note: Remember to keep planted seeds moist for proper germination and if using transplants, wait until daytime temperatures are below 100 degrees. No questions submitted for September.